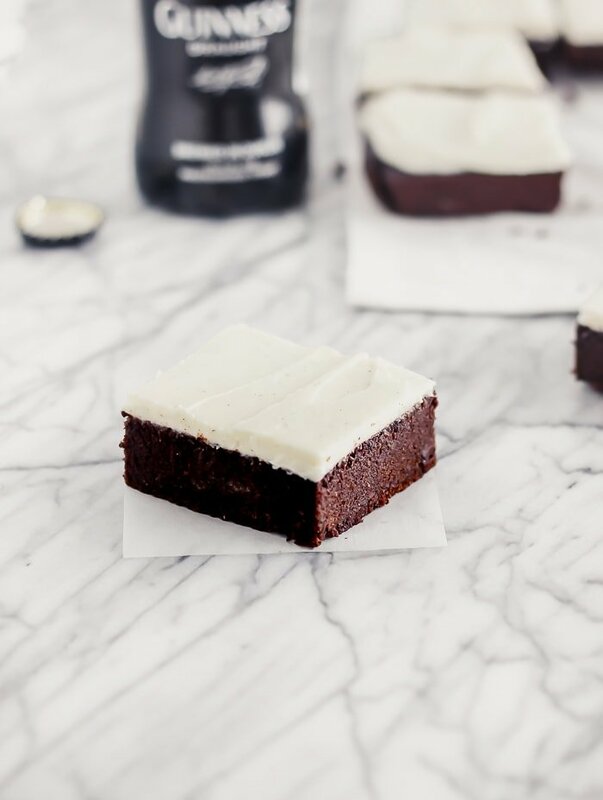 Intensely rich, fudgy Guinness brownies with vanilla bean cream cheese frosting are the perfect St. Patrick’s Day dessert, or a fun treat that any beer lover will enjoy! WOAH. You guys. 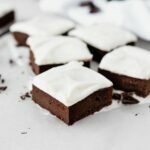 These are THE best brownies I have ever made. Like I am shocked that these came out of my oven. Shocked. I am normally not great at making baked desserts from scratch, especially cakes and brownies. Too much precise measuring and not enough “pinch of this, dash of that” for me. Also, I tend to try to slightly healthify desserts. That does not bear well for many desserts, especially ones that rely heavily on loads of sugar and butter to achieve the right texture. And it’s all about texture when it comes to brownies, am I right? I’ve finally given up my quest to make healthy desserts for the most part. Because when I want dessert, I want a real dessert. Not some version that tastes ‘meh’ (but oh it’s so good for you because it’s made with chickpeas and chia seeds and bee pollen!) No. That just doesn’t cut it for me and I’ll end up eating far more of these ‘healthy’ desserts in a quest to satisfy my real craving than if I had just eaten a couple bites of the real brownie that I actually wanted. 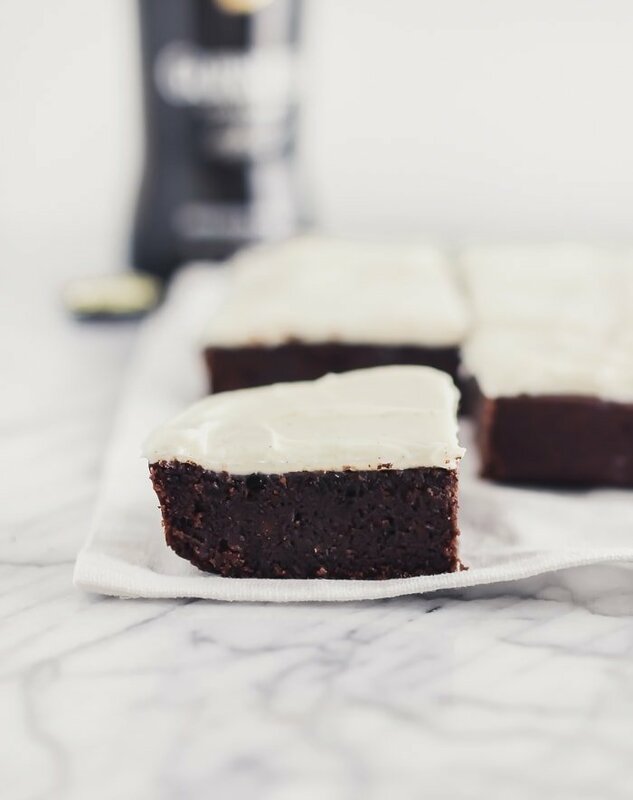 And a couple bites is really all you need of these Guinness brownies. I mean seriously you guys, they are incredibly moist and dense and fudgy with the deepest of chocolate flavors. All topped with a not-too-sweet vanilla bean cream cheese frosting that you’ll want to shovel in by the spoonful. They are To. Die. For. 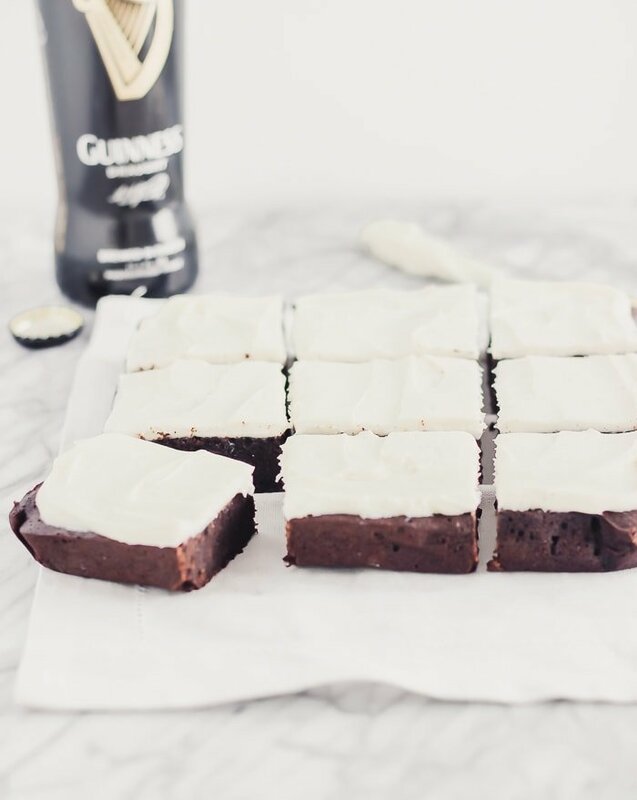 Honestly I never thought I would enjoy a brownie made with beer, but these super delicious, fudgy Guinness brownies have turned me into a believer. I don’t really enjoy beer (obviously at 6 months pregnant, I don’t enjoy beer at all right now) so why would I want it in my dessert? Well, for one, the Guinness really intensifies the rich chocolate flavor in these brownies. And also, we have had a bottle of Guinness sitting in the pantry since last St. Patrick’s Day that Mr. Table never drank, and I have been dying to do something with it just to get it out of the pantry. Because even throwing away a bottle of beer is wasting food, right? So super intense, rich, fudgy Guinness brownies it was, and I am so glad that they happened in all of their full sugar, no Greek yogurt substitutions glory. Even though I still use white whole wheat flour because that’s just what I buy and I really can’t tell the difference. But no matter. 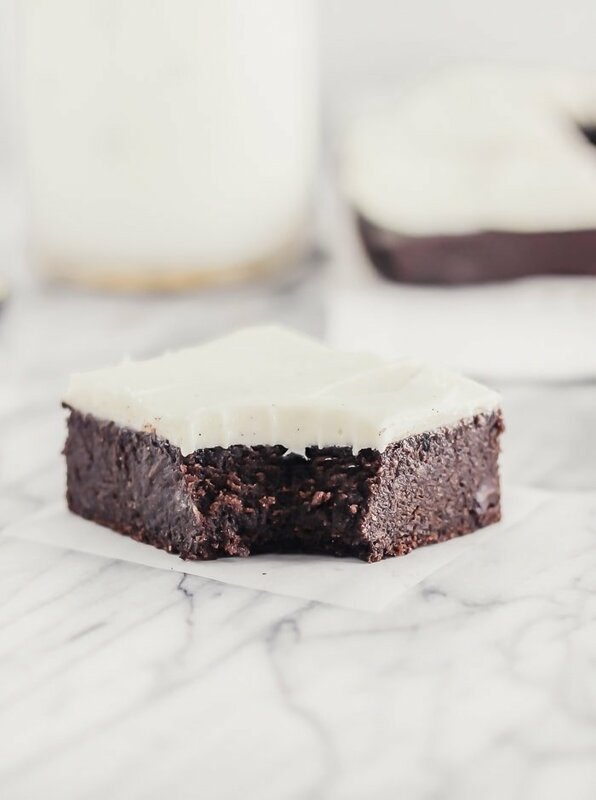 These Guinness brownies are the stuff of legend, and they are just begging you to make them and share with some friends. Or not. You can also selfishly keep them all to yourself. I won’t tell. Heat oven to 350°F. Line a square 9×9″ pan with parchment and spray with oil. In a large microwave safe bowl, melt chocolate by heating in 30-second intervals in the microwave, stirring in between each. Add brown sugar, oil, eggs, vanilla and Guinness to melted chocolate and whisk to combine. In another bowl, whisk together flour, cocoa powder and salt. Pour into wet ingredients and mix until combined. Spread batter into prepared pan. Bake for 15-20 minutes, or until a toothpick inserted into the center comes out clean. Remove from oven and cool completely before frosting. To make the frosting, beat cream cheese, butter, sugar, and vanilla beans in the bowl of a stand mixer with whisk attachment, or with a hand mixer, until smooth. Spread over cooled brownies. Cut into squares. Store any leftovers in an airtight container. *You can also use 3/4 cup all purpose flour. I admire your attitide toward indulging in dessert. I feel the same way about “healthy” desserts. I would also rather have less of the real thing than more of something that’s just ok. These brownies look amazing. 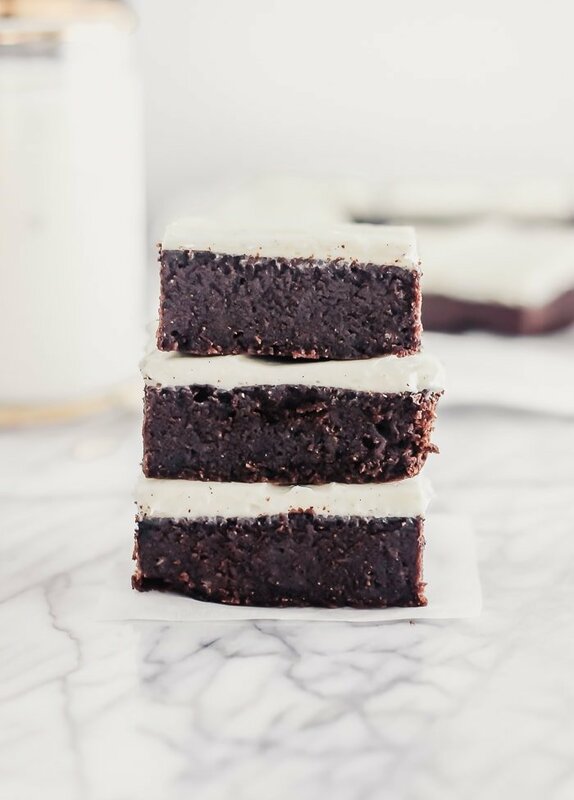 I adore the contrast of the deep chocolate brownie and that pristine white vanilla bean cream cheese frosting. So pretty! Thanks girl! I’d much rather enjoy the real thing! Thanks for stopping by!